Looking at pictures of the Moon, even from the historic “giant leap” photograph, it is easy to understand why scientists used to think of it as a big dust ball. However, “conventional wisdom” has been changing over the years. This is largely due to the information garnered from missions such as NASA’s 2009 Lunar Crater Observation and Sensing Satellite (L-CROSS) lunar-impact probe, as well as new scanning technologies and more precise measurements, which have been facilitated by enhanced instrumentation and improved analytical detection limits, on samples returned to Earth following the Apollo missions. In a paper published in the Feb. 17 issue of Nature Geoscience, researchers Hejiu Hui, postdoctoral research associate of civil and environmental engineering and earth sciences at the University of Notre Dame; Anne H. Peslier, scientist at Jacobs Technology and manager of the electron microprobe at the Astromaterials Research and Exploration Science Division at Johnson Space Center; Youxue Zhang, the James R. O’Neil Collegiate Professor of Earth and Environmental Sciences at the University of Michigan; and Clive R. Neal, professor of civil and environmental engineering and earth sciences at Notre Dame, show that they have detected significant amounts of water in the samples of the lunar highland upper crust obtained during the Apollo missions. 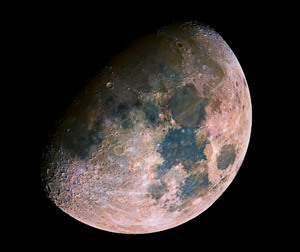 The lunar highlands are thought to represent the original crust, crystallized from a mostly molten early Moon that is called the lunar magma ocean. Originally published by William G. Gilroy and Nina Welding at newsinfo.nd.edu on February 18, 2013.